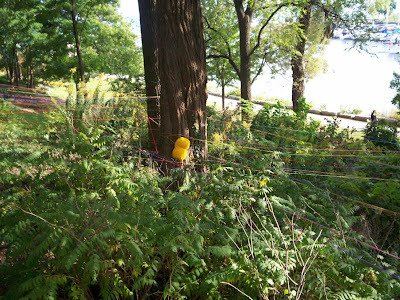 And yes, it's a ball of yarn on a tree trunk, lol. There was lots of multi-colour yarn strung about, it was kinda cool and it must have taken them quite some time to set it up! It was actually kinda pretty. Click on the photo for a close-up look. Thanks everyone ... see you next week! 79. Sandy " From the Heart of Texas"
This is my second mellow yellow! I am now walking around looking for yellow. Very addicting! I found a barrel with flowers floaing in the water... PERFECT! I do the same, walking around looking for yellow for Mellow Yellow Monday! Cool shot especially when I enlarged it. You're right it must have taken them some time to do all of that. I found a little yellow! I have kind of a fun post up this time! I like how that yellow thing is all alone in the middle. What is it? I haven't click closer yet. What a fun exhibit! You really do need to see that photo enlarged to get the whole yarn effect. My second entry for this addicting photo meme is up.Happy MYM everyone! I see yellow everywhere now;)! Lots of yellow today..Mine is ready. oh yeah, i saw it and it's cool. and there were lots of yellow also around the trees. Well, mine is up too. Looks like the survivor series where survivors had to follow a yarn in the obstacle course. I am knitting a scarf, lots of yarn. Happy Mellow Yellow Monday everyone! My entry today this week is the japanese honeysuckle flower. That is very strange art. I wonder if it was all natural fibers or if they removed it afterward. Hello there, this is my first time joining your meme.. Here is my first mellow yellow entry! Now that's a way to confuse the spiders. What a fun Mellow Yellow post! How special that you could spend such a fun day with your niece. I love it! This is one of those photos you MUST enlarge. How cool is that? Great splash of yellow, for sure. I've got a close up of brilliant Nasturtium flowers in sunlight. Before I read your piece and enlarged the photo, I thought it was a fluffy Easter chick. It's certainly an unusual art exhibit! Thanks for hosting MYM- it's such fun! almost forgot mine...nice pix! happy MYM! I thought it was maybe a lost toy attached to the tree. :) It is an unusual bit of art. Great Mellow Yellow find! Mine post is finally up for today. What a great picture! I am like Maria, I look everywhere for yellow things to photograph so I can post my Mellow Yellow... I even have my husband looking for yellow, blue and red things so I can photograph. He is really getting into it, the things he does for my blog - he is a great man! wondering what is that yellow there..better late than never!